Go on, then. Ask me anything. What a thoughtful question. Of course, I'm very fond of #000000 (black), but as I'm sure you know, this is a shade, not a color (or colour, for our friends still under thrall to the quainter version of the English language). For a favo(u)rite colo(u)r, I would choose #CD5C5C (indian red). It brings back such fond memories of my summer at Camp Chippewa. How does your wonderful friend Thing travel so quickly from one room to another in your house with out ever being seen? I like your name very much. It makes me want to put things in blenders to see what will happen. Pappa Gomez says I have a zest for experimentation. Thing usually teleports around the house. 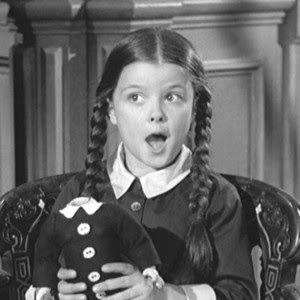 The simultaneous dead and not-dead states appeal to my family, especially my brother Pugsley. Pugsley also has a zest for experimentation. Kitty seems to enjoy it, too. I like the way Thing braids my hair better, though. Could you please tell me what your favorite method of decapitation is? 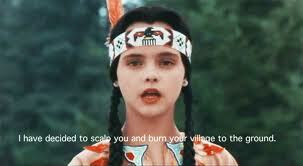 Dear Wednesday Addams, what is your favorite day of the week? Should I start a "scotch of the month" club, and encourage Luxers to mail me bottles? There was a famous VISA credit card commercial starring Jerry Seinfeld in about 1996. He got locked out of his apartment as he was talking to a woman about an upcoming date, but because he had his VISA card with him, he was able to buy new clothes, flowers, etc. and could still impress his date that night. My question is: Why did he not just use the credit card to slide into and unlock the door? I have a huge growth on my neck and I am coughing up blood lately. Do you think it is serious? Last edited by jesterme on Thu Oct 04, 2012 2:43 am, edited 1 time in total. Your question makes me smile. May I stroke your silky fur? I prefer the guillotine, although it is rather difficult to procure a proper one these days. For dolls, the Kent Scientific D-CAP model is effective, but it lacks the elegance and satisfying thwack one gets from an old-fashioned, full-sized guillotine. The patina that develops after decades or centuries of use adds immeasurably to the experience. Fortunately, my Aunt Ophelia left her c 1790 heirloom in our house when she went off to Bolivia to "find herselves". 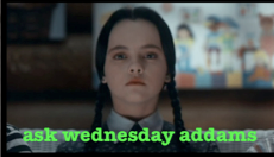 Nimrod7 wrote: Dear Wednesday Addams, what is your favorite day of the week? 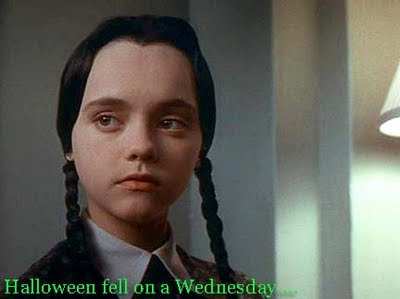 Last edited by Wednesday Addams on Thu Oct 04, 2012 2:36 am, edited 1 time in total. Only if it is made from real Scots. And you should wear a kilt, please. Not any more. You were very brave. I am about to disillusion you. This makes me sad, but as a Tycoon, it is important that you know these things. Credit card companies pay to make such lovely small films not for pure love of the cinematic arts. Oh no. The Visa credit card company hopes to make more money by convincing you to use their product to engage in the profligate purchase of marginal goods with imaginary money, then send them real money later. Their profit is greater on the use of plastic cards as imaginary money than on the more pedestrian uses (opening locks, cleaning fingernails, bookmarks). Thus, Mr. Jerry Seinfeld is paid to encourage you to do the former, not the latter. As distressing as you may find that news, Mr. Mill Tycoon, there's more. Mr. Jerry Seinfeld was paid a lot of money by the Visa credit card company to make said cinematic gem. Mr. Jerry Seinfeld has been paid a lot of money by other companies, too. People with a lot of money are notoriously bad at picking locks. I sincerely hope these revelations haven't upset you too much. Come the revolution, the Visa credit card company and Mr. Jerry Seinfeld will be held accountable, I promise you. Could you give us your thoughts on "the revolution"? Who will be affected? When will it happen? Who is gonna win? Will I still get to eat pie? I'm so pleased for you. Congratulations! 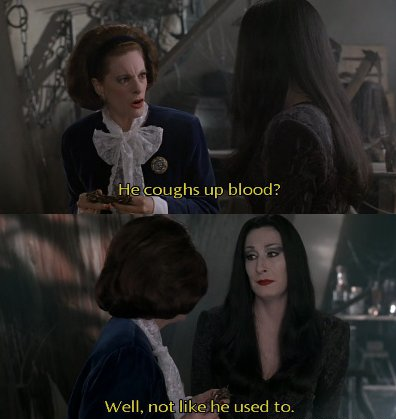 Only yesterday, Mamma was fretting about the lackluster quality of your cough lately. Can you come over and play? 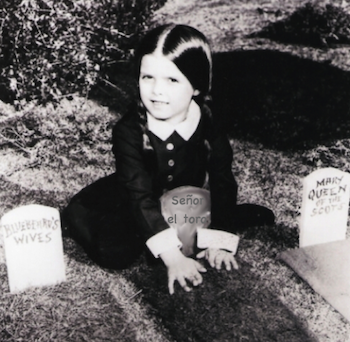 I was curious if your family are related to the Munsters and if so have you ever done your Genealogy tree? "Where is Uncle Fester, and what part of him is festering?" Yes. Everyone. Soon. The will of the people shall triumph. Of course. Your alter ego is very cute. I especially appreciate the sly nod to the prevailing mythos of superhero disguise provided by the Clark Kent eyeglasses. 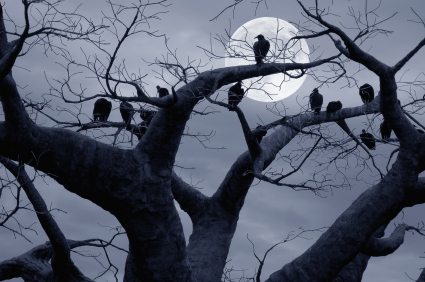 The Munsters are a mere shrubbery by comparison. I suppose if one went back far enough, there might be a slight connection between the two families. Assuming they are not all extra-terrestrial in origin, of course. If a Train moving at 120 KPH leaves Toronto at 7:00 AM heading south, and a train moving at 90 MPH leaves Buffalo, NY at 8:15 AM heading North, how do you sneak the resulting bloody body parts through customs? IF you were precariously perched upon a pointy precipice above a pond of peppy piranha, would you be perturbed? mazza wrote: "Where is Uncle Fester, and what part of him is festering?" Hello. I see that you are from Adelaide, S.A. Do you know the very famous Mr. Mazzarolo who runs naked through the streets? 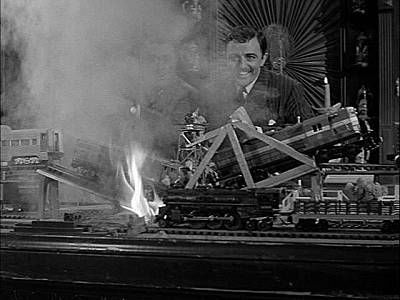 Uncle Fester is currently in our playroom, helping Pappa with some particularly delicate train collisions. Thank you for asking. I will convey your interest to him at the earliest opportunity, once the smoke has cleared a bit. My darling Mamma, Morticia, has explained the "facts of life" to me, including the infinite fascination males show for their own anatomy (and that of other males), so I will try to satisfy your curiosity. he still manages to fulfill the expectations of others engendered by his name. He tries to rotate the areas allowed to fester by season; currently, he is sporting an "autumnal left ear". I imagine that in Australia, with its topsy-turvy seasons, October would mean festering down under for you. This is the most fun question yet! You're pretty peachy. I would be positively pleased by the predicament. WATUSI! What are your thoughts on the actress Christina Ricci? I would like to know what your favorite music is to listen to while contemplating possible "accidents". Besides Halloween what holidays do you celebrate?